What's in the neighborhood around 2169 Mission? Noisebridge is of course located in the birthplace of the Mission burrito, with an abundance of Mexican places in the area, but there are many different restaurants within walking distance of the space. Several vendors are available, particularly on the weekend evenings. 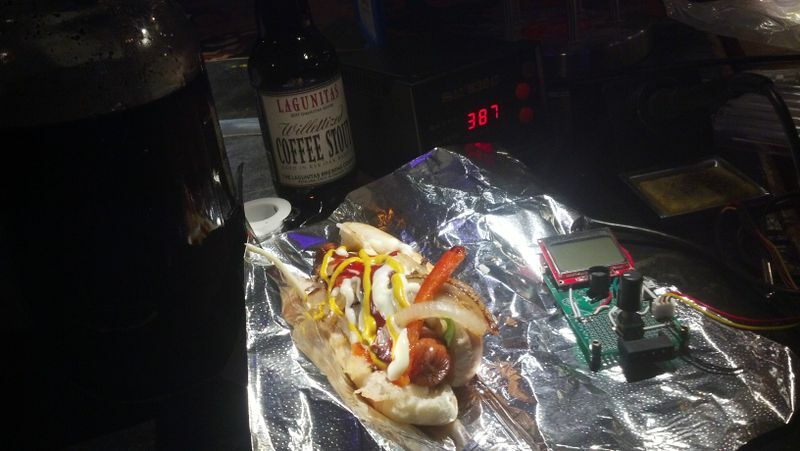 Bacon wrapped hot dogs are the staple, these can generally be found within a block by walking up mission street towards 19th, or across the street towards 17th in the front of the mexican restaurant next to mission grocery & liquor. Located directly across the street from 2169 Mission, has Vegetarian and non-vegetarian lunch combo specials. Really nice gastropub with yummy sliders (mini-burgers), roast beef sandwiches and pork belly donuts. Does takeout! A tiny place, maybe six or eight seats at the counter, that's it. Almost as many Burmese grandmothers working behind the counter. Some of the food is great. Rubin's favorite: #10, Mango Chicken, $5.25 (and maybe a coconut for $2.50). Mon-Thu 10:30 a.m. - 9:30 p.m.
Fri-Sat 10:30 a.m. - 10:00 p.m.
On South Van Ness and 18th, good burgers and fries. Since 1955. The veggie burgers are kind of bad but still edible. The garlic fries are amazing. Another taquería, excellent Mission-style burritos (order the vegetarian or a "Super"). Across the street, just past 17th. I know this isn't a restaurant, not really, although it does have tables and chairs... but it is doughnuts, and you can't not have doughnuts! They're not even really great doughnuts, but mediocre doughnuts are still doughnuts, and it's less than half a block away. Surprisingly decent apple fritter, however, and at a buck twenty-five one of the cheapest you'll ever find. Also a modest selection of Chinese pastries. Great barbecue restaurant which features a selection of shared plates (e.g. chicken wings, salad, natchez), entrees (e.g. smoked brisket, jackfruit, chicken), sides (e.g. fried pickles, cheese grits, mac & cheese), and sandwiches (e.g. pulled pork, pulled chicken, smoked seitan). Happy Hour: Weekdays 5:00 p.m. - 7:00 p.m.
Incredibly good Vegan food nearby (that really is good for everyone). 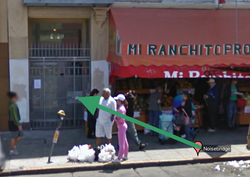 Mi Ranchito Produce & Carnicería is located directly below Noisebridge, or, rather, Noisebridge is located directly above it. It is open from 7 a.m. to 9 p.m. 7 days a week. As its name indicates, in addition to a reasonable selection of produce and albarrotes, there is a butcher counter in the back. For a cheap snack you can get pan dulce, 3 for a buck - Mexican pastries, cookies, rolls and småkaker. They also, among their produce and Hispanic groceries, have a decent supply of typical snack/junk food, as well as an impressive selection of Latin American soda pop, including the world's best apple soda, Pepsi's entry into the market, Manzanita Sol, and now Toronja ("Grapefruit") Sol, a competitor to another soft drink popular in Mexico, Squirt. There's a liquor store across the street, just past Sycamore, at 2128-2130 Mission. I'm pretty sure they're open 24 hours; if not they're open later than pretty much everyone else. They accept credit cards but charge a dollar per transaction, even though that contravenes the Merchant Agreement every vendor must sign with Visa and MasterCard. Despite the sign out front don't expect to find any actual groceries here. Lots of heavily processed junk food and delicious cheap alcohol. A dangerous place to find myself when I've got the munchies. Rainbow is is a co-op grocery store run on many of the same principles as Noisebridge. It's, like, three blocks down and a couple blocks over. They have lots of sustainable foodie type stuff, bulk food, health supplements, natural body care products, etc. There's a Walgreens right next to 16th & Mission BART, which is nice because you can get cash back from debit/ATM card purchases without having to pay a fee. "Mostly hardbound fiction," sf + fantasy section, but also some interesting non-, a few cool older books about computing (i.e. not manuals), philosophy, history etc. Sat-Sun, noon - 5 p.m. Most of this info is courtesy of Joe from Valhalla. Lasts Paints Not a good range of supplies, but two doors away. Fabric Outlet If you're sewing + need something this is just a couple doors down. This page was last modified on 17 October 2018, at 18:46.